Oonth is an Instagram store that’s got a meticulously-curated collection of silver jewellery. From earrings, baalis and carved kadas to chokers, hand-harnesses and nose rings—their collection is a far cry from the usual. If you’re someone who swears by how versatile silver jewellery can be, then Oonth is one brand you should definitely check out. Their pieces are handcrafted by skilled local artisans and curated from across the globe. Expect stuff like Malcha Mahal baalis, septum rings, Jantar Mantar earrings and more. In certain pieces, they’re even open to colour customisations. Despite being statement pieces, we love that they can still be worn daily and make you look like super stylish. 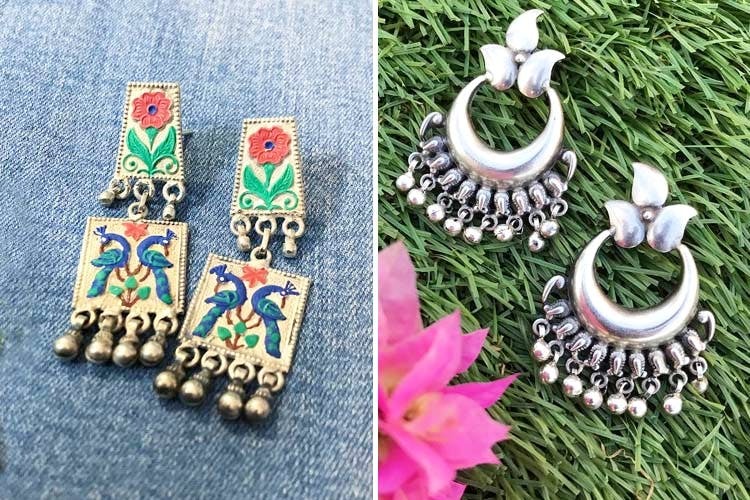 From what we observed, the earring collection was the most vast, which made us wish that their collection was just as abundant for other items (like rings, pendants, kadas etc.). Fan of fusion? Just wear any of their pieces with a minimal western outfit and carry it with élan.